Psoriasis is a skin disease that affects the speed of skin cell development. It often creates thick silvery scales accompanied by dryness, itching and redness. The scalp and most areas of skin can be sites for psoriasis. Most people with psoriasis experience chronic flare-ups that may have a specific trigger. The Mayo Clinic points out that psoriasis can be triggered by things like infection or stress. When psoriasis cannot be prevented its symptoms can be treated. There are many methods of treatment, some of which focus on removing the build-up of scales. Cover the area affected by psoriasis with a thick moisturizer or emollient. There are many prescription and over-the-counter products specifically made for psoriasis. Wrap the area with plastic wrap or put a shower cap over your scalp before bed. Trapping the body heat with the moisturizer will help prepare the scales for removal. Pour a generous splash of bath oils and a few handfuls of oatmeal or Epsom salts into a warm bath. Remove the plastic and soak in the tub for 15 to 20 minutes. Gently rub the area to remove the scales toward the end of the bath. 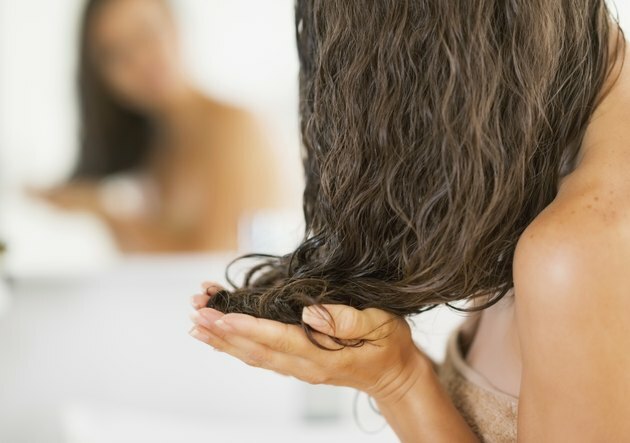 When treating psoriasis of the scalp, apply a specially formulated shampoo to the scalp. Gently massage it into the hair and skin and rinse thoroughly. Dry off from the bath. Comb your hair to remove lingering scales. Apply a moisturizer to your body to keep the scales or areas of psoriasis well hydrated. Avoid very hot showers or baths, as this can further dry the skin. Try other over-the-counter psoriasis products, including salicylic acid, to scrub off the scales. Request a prescription-strength cream or cleanser from your doctor to treat stubborn scales. Spend a few minutes in direct sunlight to slow the growth of new scales. Do not rub or tear the scales off vigorously, as it will only further irritate the skin.